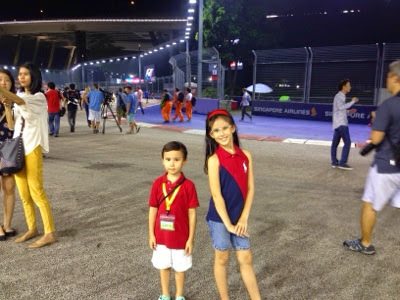 The highlight of last week in Singapore was the Singapore Airline Formula One Night Race Event. The entire city was buzzing with all things related to the F1. The little boy, being not so little anymore at the age of five, had been very excited about the race because his friends in school were talking about it. Some of them were going to be watching the race. 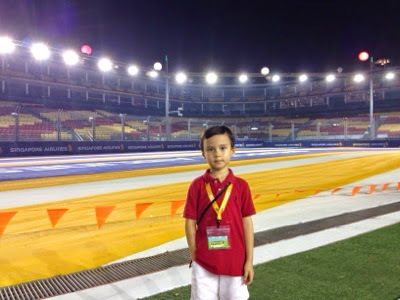 He had asked about going last year but thinking that he was too young to really enjoy it, we were quite hesitant to spend the money getting the tickets since neither of his parents are keen. This year, being the doting mum, I was still thinking that maybe one of us could just bring him for one of the nights. The husband, however, disagreed. 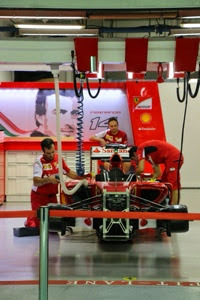 So, one afternoon I was surfing on the Singapore GP website and came across the Thursday Pit Lane Experience page. 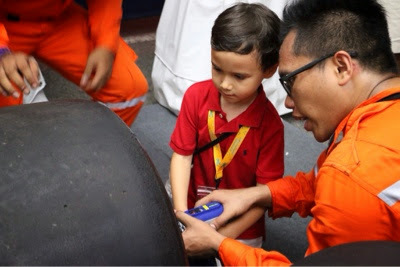 Now, one of our concerns with bringing the boy to the race is that the noise is really loud and that it could cause permanent damage to the ears. It does not help that the organisers make parents sign a disclaimer that states they are not responsible for hearing damage etc. So, the Thursday Pit Lane Experience sounds like an awesome idea and there was a ballot on the page for two of the tickets to the event. I quickly submitted hubby and my name for the ballot. Lo and behold, we both won the tickets! What are the chances?! With that, even though normally the children's bed time is at 8pm, we decided that we should make an exception for this special experience! 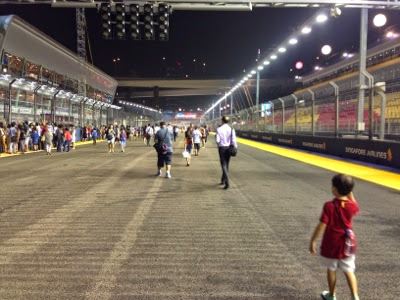 The Pit Lane walk was going to start only at 9:20pm but what an awesome fun it would be for the kids. On Thursday (18 Sept), I made sure that the boy had a nap after coming back home from school. 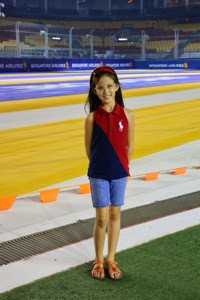 We left home around 7:30pm and parked the car at the stadium and took the mrt for one stop to Nicoll Highway station and walked for about 10 minutes to the Marina Bay Circuit Gate 1. There were some food stands in the village but they were not exactly interesting nor yummy. Oh well, we were not there for the food. There were also some activities. The boy managed to try changing the wheels of a F1 car! After hanging around for an hour, we noticed that a queue was forming to get into the circuit. By the time we managed to walk to the queue, it had stretch to possibly 400m long! After waiting for another 30 minutes, we finally managed to get onto the pit lane and that was when the real fun started! 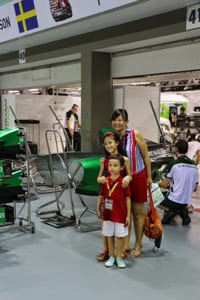 The highlight of going onto the Pit Lane experience was visiting the various teams garages to see the race cars. All the garages had simple temporary barricades to prevent the visitors from getting too near. We were, however, very blessed in that at the Caterham Team garage, a very nice gentleman saw how the little boy was looking intensely at what the mechanics were doing and opened the barricade to allow us in! The closest we got to a racing F1 car! 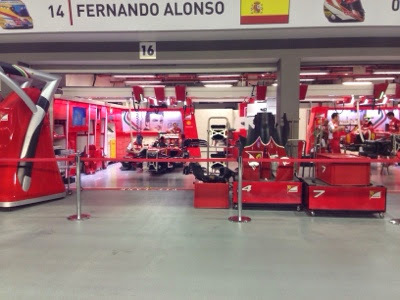 Checking out the Ferrari Garage of Fernando Alonso! A funny thing happened just as we were at the Ferrari garage, a young man standing next to me commented, "If you can get in here as well, I would be your son too! I can be 5 years old!" Hahahah. Guess he saw us at the Caterham garage. That really showed how privileged we were to have the chance to get so close inside. And after a long walk past all the various teams, we finally got to the end and were going to walk back out when we kept hearing loud noises which I did not know what made it. I am really quite clueless when it comes to the Formula One race. We then saw a crowd watching one of the teams and realized that it was the sound of wheels being changed. The team from Scuderia Toro Rosso was practising their wheels changing sequence. The papa took the boy on his shoulders so that he could look at what was happening. The boy really enjoyed watching how the wheels would be changed in a split second and it was a wonderful finale for him. By then, at almost 10.30pm, we can finally start to head home!